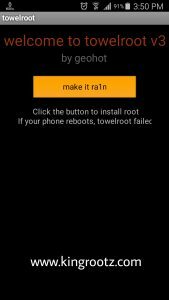 Towelroot is a small (Only 100 KB) apk tool for Android which allows you to root any Android with one click. You don’t need to connect your device with a computer. 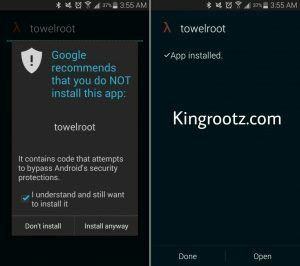 If Towelroot support your device, it will root your device within a few seconds. After installing the app on your device, just run it and tap the button that says ‘make it ra1n’. The app was developed by Geohot. who has found vulnerabilities in Apple devices. So the app has more possibilities to root any Android device. You don’t need to use any computer. No need to restart the phone. This is a trusted tool, TowelRoot doesn’t collect any personal information. Procedure : First Download and install the app. After installing the app, open it. You will find a button with the text “Make it rain”. Just click on that button. if your device is vulnerable, the app will root your device within a few seconds. Your phone will not be restarted. Your device can be bricked or unusable. The process is little risky though most of the cases it is risk free. If you root your Android device, you will loose your device warranty provided by the manufacturer. 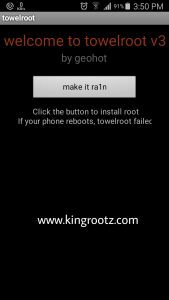 You can unroot your device whenever you want! my note 4 phone isn’t currently not supported. why? Latest Android versions are difficult to root.